Now, I don’t want to get too excited, and I don’t want to give too much away – after all, we want you to watch our shows when they are broadcast. But I think we’ve just seen the first signs of the Human Spark – right inside Alan’s head. We spent the day at MIT’s McGovern Institute, where Alan’s brain was being scanned while doing tasks set for him by MIT’s Rebecca Saxe and Harvard’s Randy Buckner. 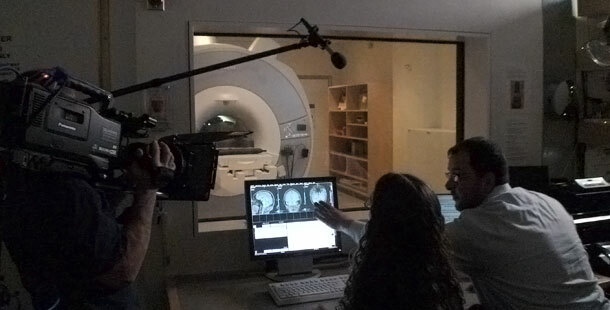 Our filming Alan while he’s having his head examined is nothing new, by the way; in the days of Scientific American Frontiers we must have had him in and out of some half dozen MRI machines over the years. In fact, Randy remembered one of those shows, where another Harvard researcher had told Alan that he had a “plump hippocampus,” the brain region involved in helping lay down memories. Randy confirmed Alan’s hippocampus is still plump; in fact, Randy told Alan that he wouldn’t have guessed his age from looking at his brain. There’s a story behind why we filmed with both Randy and Rebecca, who – while both rising stars in the neuroscience field – are actually working on two apparently unrelated special skills we humans possess. Rebecca has made her name by studying the brain regions involved in thinking about other people, especially thinking about what they are thinking about. Randy, meanwhile, has been studying how we think about the past, and more recently, how we think about the future. I’m going to leave it to you to work out why Alan and the crew found these ideas so exciting, with the not very subtle hint that figuring out what others are thinking on the one hand, and being able to mentally time travel on the other, are two skills which, if not uniquely human, are in humans uniquely powerful. 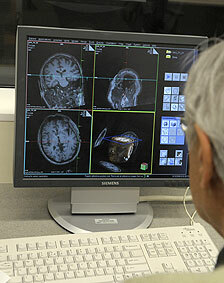 And the discovery that they appear to involve related brain areas – well, Sparks are flying. 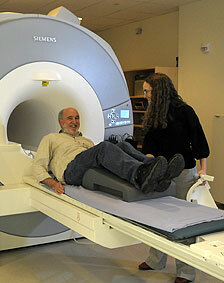 As a postscript to the day, Rebecca offered me a chance to have my brain scanned in the McGovern Institute’s very fancy new MRI machine, which looks, by the way, a little like a set for “House.” Now this is something I’ve been given the chance to do many times over the years, going back to not long after MRI machines were invented. I’ve always said no, reasoning that my brain might turn out to be a little less than the perfectly honed machine I’ve always assumed it to be. But this time, inspired by Alan’s pristine hippocampus, I allowed myself to be slid into the tube and tried to think of nothing. You can see the results below. I have a sneaky feeling Randy thought Alan’s brain looked better.